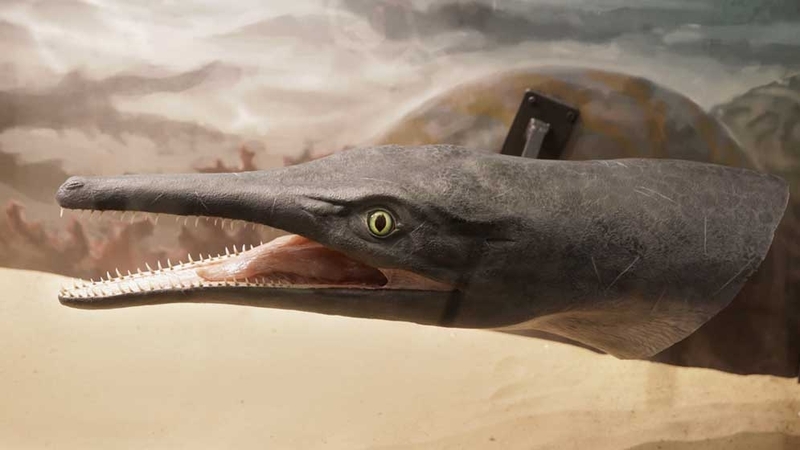 One hundred years later, the fossils of the first marine crocodile from the Jurassic period found in South America return to the Argentine Museum of Natural Sciences. 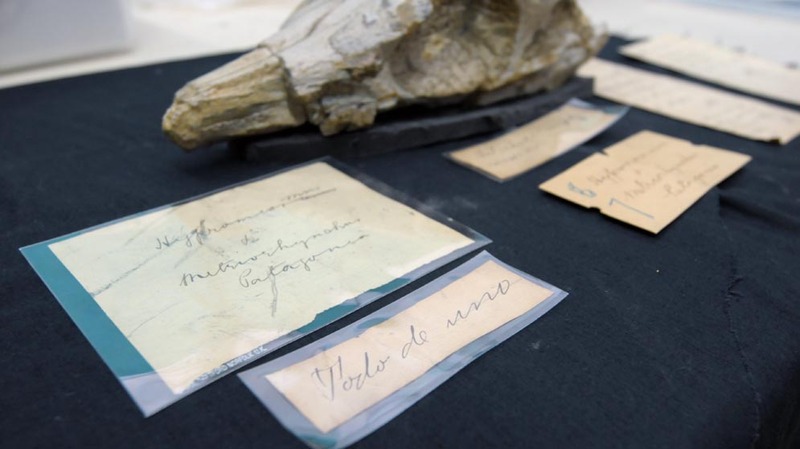 ‘Ameghino’s crocodile’ returns to Argentina over 100 year later. Photos: CONICET Photography. Buenos Aires, 1907. Argentine naturalist and director of the Argentine Museum of Natural Sciences (MACN-CONICET), Florentino Ameghino, received the fossil of a marine crocodile of the Jurassic period – approximately 190 and 145 millions of years ago– found in the mountain range area of the province of Neuquén. As he was not an expert on that field, he decided to contact his colleague Arthur Smith Woodward, who worked at the Natural History Museum of London. Ameghino asked him if he was interested in studying them, as it was the first time a reptile like that appeared in South America and Woodward had already described similar materials of crocodiles from the Northern Hemisphere. The British accepted and Ameghino sent him the remains of the reptile. 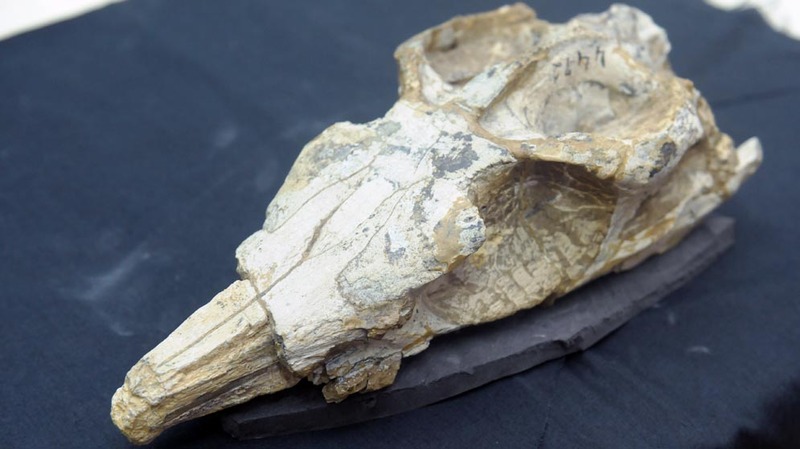 Nevertheless, after Ameghino’s and Woodward’s deaths the fossils were forgotten until 2010 when Lorna Steel, Curator of the Division Vertebrates and Anthropology Palaeobiology, department of Earth Sciences of the Natural History Museum of London, looked for their historical records. “I was motivated to search for their provenance because I wanted to reach a decision about registering them officially into our collection, or not”, the curator comments. After finding and checking the original letters written between Ameghino and Smith Woodward, the curator realized the fossils had been lent by Ameghino when he was the director of the MACN; so she contacted Alejandro Kramarz, curator of the Collection of Paleovertebrates at the Museum to determine what to do. “These are really important remains because they were the first of their type for the whole South American continent”, Kramarz explains. At the time when it was found, researchers knew that that type of crocodile had inhabited the Northern Hemisphere but there had not been evidence of their presence in South America. If the study had been published by Smith Woodward, it would have been the first find scientifically documented for the region. 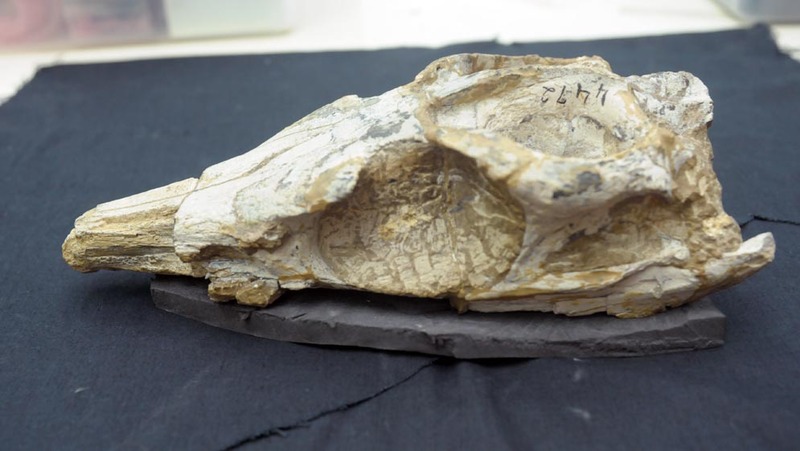 “It was in 1927 that the first record of marine crocodile fossils in South America was published, and this one was 20 years less”, the researcher adds. Over the twentieth century other marine crocodile remains were found in Neuquén, and they were formally described in 1976 as Cricosaurus araucanensis. “Cricosaurus comes from the Greek crico (ring) and saurus (reptile) referring to the sclerotic ring that supported the eye of this animal; and araucanensis for the Araucanía region, where they were discovered”, Kramarz explains. The Cricosaurus (metriorhynchid talatosuquio or sea crocodile) was found in the province of Neuquén at the beginning of the twentieth century but there is no exact date of its find. It was established that the remains were from the Jurassic period and Ameghino sent the almost complete skull to his British colleague –lacking only the tip of the snout-, some vertebra, several bones of the legs and two specialized glands located in the skull. “These marine crocodiles had glands that secreted sea salt through holes in the nose, one adaptation that appears in some animals that live in brackish waters”, Belén von Baczko, CONICET doctoral fellow at the MACN and one of the researchers in charge of studying the fossils, explains. These glands disappeared over the years but the sediments that entered the cavities after the death of the specimen reproduced the shape they used to have, and that material is being studied by researchers. The skull, in addition, shows that this animal had a long snout and the eyes were on the sides of the head- not high on its head, like current crocodiles- what proves that it lived under the water. Furthermore, the legs were modified as fins, which worked as a rudder, and the tail ended in vertical fin, which helped him to propel itself into the water, like sharks. “These animals could be up to three metres long and lived exclusively in the sea, unlike today’s crocodiles that can move on land”, von Baczko adds. Through the analysis of the letters between the Argentine and the British scientists, Pablo Tubaro, CONICET principal researcher and director at the MACN, explains that Ameghino had received those remains shortly before contacting Smith Woodward and as the British knew very well that group of reptiles, the Argentine decided to send the fossils to him for analysis. “The only condition of Ameghino was that if Smith Woodward made an important discovery, the results had to be published in the annals of the National Museum of Buenos Aires (current MACN). 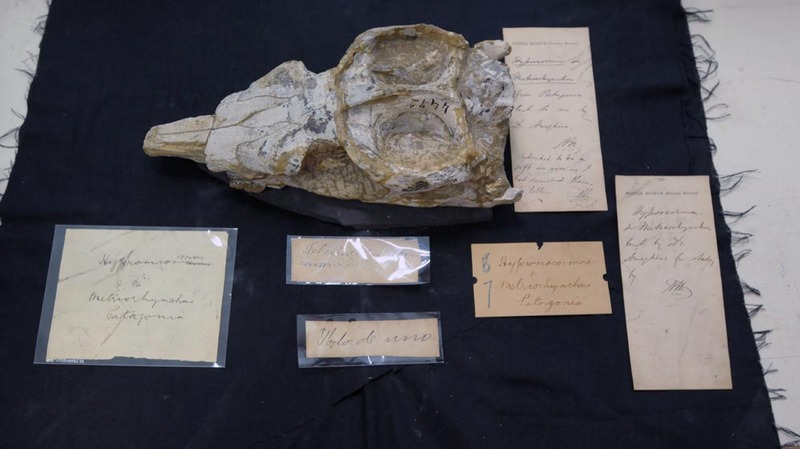 Woodward accepted it but asked Ameghino to conserve in the Natural History Museum of London the repeated pieces – if any – of the fossil; and the Argentine naturalist agreed to that”, the researcher explains. Some years later Ameghino mailed his colleague to ask him about the research but Woodward replied that as he had been appointed as curator of the Geology Department of the British Museum of Natural History, the study had been delayed. After Ameghino’s death in 1911, and later on Smith Woodward’s death in 1944, the fossils remained in storage. “These fossils were shown to me by a previous curator, Dr. Angela Milner, probably around 2010. She explained that they were from Argentina, and were sent to Arthur Smith Woodward by Florentino Ameghino in the late 1800s or early 1900s. She said that previous curators were unsure what to do with the specimens, and had been unable to establish their provenance”, Lorna Steel explains. For this reason she began to look through the historical archives of the Natural History Museum and found the original documents. “To see and hold the handwritten letters sent from Ameghino to Smith Woodward was really special. Ameghino usually wrote in French to Smith Woodward, and this was one of the difficulties that I faced when trying to understand the agreement that was made between the two men”, she adds. Knowing that the remains had come from the MACN, she contacted Kramarz, who travelled to London in 2015 to bring the fossils back to Argentina. “In the historical archives we found with Dr. Steel the original materials list and noticed that there were pieces that were repeated. Nevertheless, as we were not sure whether those repeated bones belonged to the same individual or not, they decided not to separate the pieces”, the researcher explained. After spending more than a century away abroad, the Cricosaurus, known as ‘Ameghino’s crocodile’ returned to the Argentine Museum of Natural Sciences and the original fossils, along with a reproduction of its head, will be presented today in the exhibition that was prepared to tell the story and the trip of these pieces that were recovered one hundred years later. Translated version by: Cintia B. González.